This year Fitzwilliam celebrates 50 years as a College. To mark the occasion Fitz Bar is serving two new beers: Billy Pride and Fitz Lager. 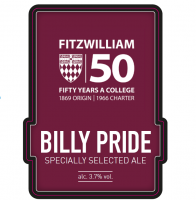 Chris Mason, Bar and Cellar Supervisor, came up with the idea of naming the ale ‘Billy Pride’, but the name will resonate with generations of students from Fitzwilliam. The bar will also be offering ‘Fitz Lager’ (4.0% ABV), a classic blonde sparkling variety made of 100% Scottish barley and hops, which gives it a clean refreshing taste with a subtle biscuity malt. Fitz Bar recently changed its beer supplier to the more local Greene King, and the brewery offered the College the chance to produce its own house draught beers. Billy Pride will certainly be making an appearance for the special gathering, in July, of students who first came to Fitzwilliam in 1966, 50 years ago. It was the first year the College could actually call itself a College. The Royal Charter granted in 1966 established Fitzwilliam as a full, independent College in the University of Cambridge; but Fitzwilliam’s origins actually date back nearly 150 years to 1869. It was in 1869 that the University set up the ‘Non-Collegiate Students Board’ to develop more economical ways for students to study at Cambridge. The cost of being a ‘non-collegiate’ student at Cambridge was half that of being a member of a college, and at the same time access to the University was widened. The College takes pride in its origins and commitment to widening participation and continues to pioneer schemes to attract students from all backgrounds.